One thing you can say about sailboat racing is that it�s seldom too quiet out there. Just ask anyone who has watched a big-fleet start from the stern of a committee boat. Or someone who�s been stuck in the middle of a raft-up at a leeward mark. 2) "Protest" when one boat wishes to protest another for an incident that occurs while you are racing. If these are the only required hails, then what is everyone saying out there? Besides a few emotional outbursts that are heard in almost every sport, sailors communicate in many ways to help them get around the buoys as quickly as possible. In my experience, these "optional" hails fall into four general categories, each with its own different purpose - persuasion, instruction, protections and courtesy. Let�s look at some specific hails in each group and how you might use them on the race course. Hailing can help you exert influence over certain tactical situations. The object, when racing, is to "control" other boats as much as possible and not be controlled. This is where careful use of words can be helpful. "Cross or tack?" There are several variations on this hail including Can I cross?" and "What do you say?" (see Figure 1). All of these are intended to encourage a starboard tack skipper to let you cross ahead; otherwise you�ll plant a big lee-bow tack in front of him. They often work, but you must be sure to communicate early and clearly. Don�t try to cross on port unless you hear a clear confirmation from the other boat. As too many people have found out, "No!" often sounds a lot like "Go!" "Tack if you want." When sailing on a beat, you�ll often have a boat on your lee bow giving you bad air or water. 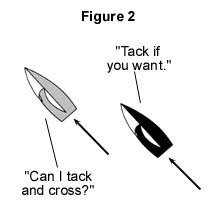 If you want to stay on that tack, tell the other boat he can tack and cross you (Figure 2). Sometimes his only reason for not tacking was he didn�t want to foul you. A corollary to this hail happens when you�re the boat to leeward and ahead. If you want to tack, but you�re afraid of tacking too closely to the windward boat, say something like "Can I tack and cross?" Often the other boat will be happy to let you go and get out of his way. As I often tell my kids when they are shy, "It doesn�t hurt to ask." "Let�s stay down." When you are sailing on a reach or run, the last thing you want is a boat just behind taking you way high of the rhumb line. A friendly "Hey, let�s stay low and go for the mark" is often sufficient. If this gentle style doesn�t work, you may need to say something more assertive like "There�s no way you�ll ever pass me to windward, so don�t even think about it." Sometimes a hail is useful to make sure nearby boats understand the rules. Don�t assume other competitors will behave as you expect them to; if you do, you may compromise not only your position in the race, but your safety too. It�s better to avoid an incident than it is to be "right" and lose 10 boats. When you make a tactical rounding at the leeward mark, for example, boats behind may be tempted to sneak inside. A simple "Don�t go in there," or "No way," will let others know they have no right to room. "Don�t sail above your proper course." One of the most frequently misunderstood new rules is rule 17.1, which involves luffing. 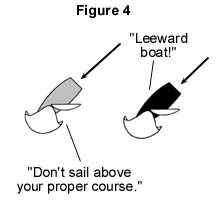 When a leeward boat overtakes you from astern (figure 4), rule 17.1 says they may not sail above their proper course as long as they remain overlapped and within two hull lengths of you. Since it can be easy to forget how an overlap was established, don�t hesitate to hail a reminder when necessary. "Don�t tack too close!" 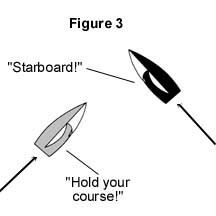 Sometimes when you�re in a pinning position to windward of another boat, your opponent will be tempted to tack (for example, to fetch the windward mark). If you�re in the right place, however, they won�t be able to tack without fouling you. To prevent a problem, remind them not to tack too close. "Hold your course." This hail can be helpful when you are on port tack ducking behind a starboard tacker and you don�t want them to tack in front of you (Figure 3). Saying "Hold your course" does not actually require the other boat to steer straight; however, it does remind them to be careful about changing their course while you are keeping clear. This hail is effective in crowds when the starboard tacker may not see a port tacker ducking behind. In these situations, it prevents S from inadvertently tacking right in front of (and possibly fouling) P.
"Don�t take too much room." Here�s a good example of how you can help other sailors learn the rules and help yourself at the same time. When you�re outside at a leeward mark and you have the right of way, remind the inside boat that they�re allowed to take only enough room for a "seamanlike" rounding. Whenever the inside boat must jibe at the mark, remind them that they cannot sail farther from the mark than needed to sail their proper course. 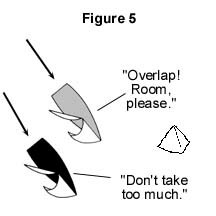 This should help you get a better position as you round the mark on their transom (Figure 5). One of the main reasons for hailing is to "paint a picture" of a situation for all the boats involved. This is important to clarify rights and obligations, and to establish facts in case there is a protest. Though most hails of this type are not required by the rulebook, they are certainly a good idea to protect yourself. "I have my helm hard over." Rule 16 (Changing course) allows a right-of-way boat to do a limited amount of "hunting." When this happens, a give-way boat must make every effort to keep clear. For example, you are sitting on the starting line in light air and a leeward boat starts to luff you. You put your helm all the way over (and trim your main), but your boat responds slowly, and the other skipper keeps yelling at you to come up. Since you are doing everything you can to get out of the way, tell the other boat you have your helm hard over. The rules don�t require you to do any more. "Tack complete . . . One second . . . Two seconds . . ." Whenever you tack into a lee-bow position, rule 13 says you must keep clear of the other boat until you are on a close-hauled course. There is no longer a rulebook onus on the boat that tacks, but it can still be hard to prove you didn�t tack too close. So when you tack near starboard tacker, consider hailing "Tack complete" in a loud voice as soon as you reach a close-hauled course. Then start counting off the seconds. This may help if you end up in a protest. "Overlap/No overlap." Many sailors are surprised to learn the rulebook does not require a hail for "buoy room." However, this doesn�t mean you shouldn�t hail about the presence or absence of an overlap. In fact, I recommend you hail every time you are near another boat as you approach a mark (Figure 5). Don�t wait until you get to the two-length zone before making this hail. If an overlap is in doubt, start hailing six or eight boatlengths from the mark (even if your competitor gives you a funny look). This will help establish whether or not there was an overlap before you reached the zone, and that may be critical for buoy room (see rule 18.2c). "Rock . . . Rock . . . Rock . . ." If you think another boat is breaking the Propulsion rule (rule 42), don�t just say "Hey, stop pumping." Instead, let them know you�re watching by counting out loud every time they rock or pump. You�ll be amazed at how effective this is. My favourite hails are those that are simply courteous. There�s nothing more refreshing and uplifting than making or hearing a hail with no purpose other than kindness, good sportsmanship or good seamanship. We can all make the sport more enjoyable with this kind of communication, and we will be treated nicely in return. "Starboard!" Contrary to what many beginning racers think, this common hail is not required by the rules. 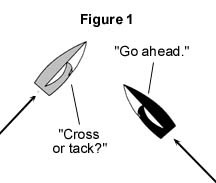 However, it is made almost every time two boats come together on opposite tacks (Figure 3). Of course, the way this hail is delivered will change the way it is perceived. If you shout it gruffly and loudly while the port-tack skipper is looking right at you, you�ll be perceived as aggressive. But if you say it calmly when you are not sure if the other boat sees you, you�ll be courteous. "Go ahead." If you�re on starboard tack upwind and a port tacker is about to cross you, why not tell him to go ahead. By letting him know he can cross you, you save him a lot of nail biting, especially if the crossing was going to be close. Even if you have to bear off slightly, letting the other boat go across is often better than having him tack on your lee bow (see Figure 1). "Nice race!" These two short words are not said often enough. Don�t save you�re congratulations for the race winner only. Try to praise other competitors who did something well in that race. Finally, here�s a word of caution on boat-to-boat hails. According to rule 41, you may not receive "outside help" while you are racing. And the Fair Sailing rule says you must "compete in compliance with recognized principles of sportsmanship and fair play." Since hailing involves interaction with other competitors, you have to be a bit careful. If, for example, the purpose of a hail is to team up with other boats or to intimidate your competitors, you could be breaking a rule. On the other hand, I believe a certain amount of give and take helps us all play the game better. It also makes the sport more enjoyable. So be creative, and judicious, in you use of hails.